In the heavens he built a new hut. 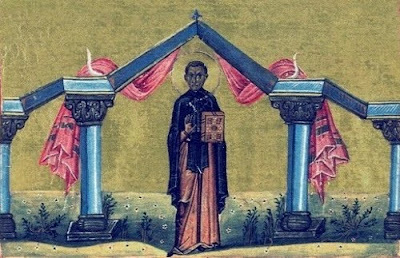 Saint John the Hut-Dweller was the son of rich and illustrious parents, and was born in Constantinople the early fifth century. He received a fine education, and he mastered rhetoric and philosophy by the age of twelve. He also loved to read spiritual books. Perceiving the vanity of worldly life, he chose the path that was narrow and extremely difficult. Filled with longing to enter a monastery, he confided his intention to a passing monk. John made him promise to come back for him when he returned from his pilgrimage to Jerusalem, and take him to his monastery. The monk kept his promise to come back for John, and they went secretly to Bithynia. At the Monastery of the "Unsleeping" (Akoimitoi), he received monastic tonsure. The young monk began his ascetical labors with zeal, astonishing the brethren with his unceasing prayer, humble obedience, strict abstinence, and perseverance at work. St John explained his situation to the abbot St Markellos (December 29) and he asked to be released from the monastery. He begged the abbot for his blessing and prayers to return home. He bid farewell to the brethren, hoping that by their prayers and with the help of God, he would both see his parents and overcome the snares of the devil. The abbot then blessed him for his journey. St John returned to Constantinople, not to resume his former life of luxury, but dressed as a beggar, and unknown to anyone. He settled in a corner by the gates of his parents' home. His father noticed the "pauper," and began to send him food from his table, for the sake of Christ. John lived in a small hut for three years, oppressed and insulted by the servants, enduring cold and frost, unceasingly conversing with the Lord and the holy angels. At first, she did not wish to go, but she was curious to know what this beggar had to say to her. Then he sent her another message, saying that he would die in three days. John thanked her for the charity he had received, and told her that God would reward her for it. He then made her promise to bury him beneath his hut, dressed in his rags. Only then did the saint give her his Gospel, which he always carried with him, saying, "May this console you in this life, and guide you to the next life." * This Gospel Book is kept today in the Monastery of Pantocrator on Mount Athos. From your early youth, you longed with fervor for the things of the Lord. Leaving the world and its pleasures, you became an example of monastic life. 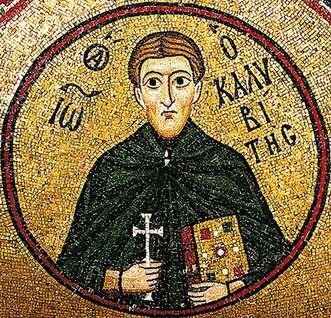 Most blessed John, you built your hut at the door of your parents' house and overcame the devil's guiles. Therefore Christ Himself has worthily glorified you. Longing for poverty in imitation of Christ, you abandoned your parents' wealth, wise Father John; grasping the Gospel in your hands, you followed Christ God, unceasingly praying for us all.